Crest 3D White Gentle Routine Whitestrips: Better For Your Teeth? Sensitivity during teeth whitening is not uncommon; even with professional in-office treatments. If you’ve got teeth that are sensitive to whitening products, Crest 3D White Gentle Routine Whitestrips (view on Amazon) can help you achieve a winning smile at home without any discomfort and for a fraction of the cost. According to the ADA, the teeth whitening industry is growing fast. Teeth are naturally white – aging and bad habits cause them to yellow. This means we are hardwired to see white teeth as a sign of youth and good health. And in our modern world, a great smile is also a sign of success and confidence; over 70% of people believe that a winning smile can be a deciding factor in career advancement. Despite being the most requested dental treatment, teeth whitening is not without its dangers. So it’s important to put some work into making sure you get the safest and best result possible. And that’s what we’ve done for you in this Crest 3D White Gentle Routine Whitestrips review. Crest 3D White Gentle Routine Whitestrips cater to a specific audience. For those that do not suffer with sensitivity, these won’t help you to achieve the best results. However, for those that have always wanted to whiten their teeth but have been concerned with the discomfort levels, Gentle Routine Whitestrips are a great option. 1.) Do Crest 3D White Gentle Routine Whitestrips work? Do they whiten your teeth? Yes, but they are not as extreme as other Crest 3D white products. Crest 3D White Gentle Routine Whitestrips utilise the same enamel-safe technology used by dentists. They work by delivering hydrogen peroxide to the core of the tooth, bleaching away staining and discoloration. They also use Crest 3D White Advanced Seal technology so there’s no slippage and you always get maximum coverage and maximum results. However, they are gentle on teeth and gums because lower level of peroxide is used. For example, concentration is 5.2% in this product, compared to 9.5% in Crest 3D Professional Effects Whitestrips. The lower concentration helps to avoid the discomfort of sensitive teeth and gums, but ultimately means that the whitening power doesn’t compare to full strength products (view details). 2.) Are Crest 3D White Gentle Routine Whitestrips Safe? All Crest 3D White Whitestrips use the same enamel-safe whitening agent that dentists use and Crest 3D Gentle Routine Whitestrips are specially formulated for sensitive teeth. The lower level of peroxide make these strips safer than any other Crest product. Those with extremely sensitive teeth may still experience some irritation, but this is not uncommon. Studies show that teeth whitening technology using hydrogen peroxide is safe when used correctly. Sensitivity should be significantly less than should be expected with full strength whitestrips. You can pair your treatment with a sensitive toothpaste to help strengthen enamel and numb the area. If you are unsure, you should always speak to your dentist first. 3.) How soon can you expect results? Crest 3D White Gentle Routine Whitestrips should be used daily for 14 days, not as one off treatments. As the peroxide level is lower, results are not immediate but should be noticeable after the 2 week period if you follow the instructions properly. Bear in mind though, teeth whitening kits do not work in the same way for everyone. For example, heavy smokers or tea drinkers might get different results from non-smokers who avoid tea and coffee! It’s also important to remember that whitening products only work for natural teeth. If you have crowns, caps, veneers or fillings, the color of these will not be altered. For best results, always consult your dentist who can guide you to the best product for your teeth. 4.) How long will results last? This depends on each individual person – diet and oral hygiene are contributing factors. Cigarettes, coffee and red wine are known to stain teeth. If you indulge too often in these, results will not last the maximum amount of time. Otherwise you can expect your results to last at least 4-6 months, if not more. Some users report results for as long as 12 months! Whilst there is no hard and fast rule for how long your results will last, Crest 3D White do guarantee a brighter, whiter smile for at least 2 months. Coffee, red wine and smoking are well known culprits, but other foods that stain include curry, balsamic vinegar and dark sodas. Your teeth are particularly susceptible during the course of your treatment. Limiting your intake during this time can significantly improve results. If you just can’t resist that glass of red wine, simply rinse your mouth with water immediately after to prevent stains from settling in. Great oral hygiene is critical to maintaining a beautiful smile. Always brush your teeth for 2 minutes twice a day, and don’t forget to floss to remove build up from those hard to reach areas. For ultimate results, try water flossing with the Waterpik Whitening Water flosser. It’s fun, effective, and helps to maintain a dazzling smile. Who better to help you maintain a great smile than a person who is trained to do it? Keep up your regular 6 monthly check-up and you’ll be able to maintain a white, bright and healthy smile all year round. 5.) Is there anything better? If you have sensitive teeth, then the answer is no. Crest 3D White Gentle Routine Whitestrips are the best bleaching option out there for anyone who has elevated sensitivity. While they may not be the strongest, they tread the balance between effectiveness and comfort – a factor that should never be ignored. For those who don’t suffer with sensitive teeth, you may wish to opt for a stronger formula such as Crest 3D White Professional Effects or a gel kit like Opalescence Go. Crest 3D White Gentle Routine Whitestrips are a gentle and affordable alternative to professional whitening at the dentists. The majority of users report no burning gum sensations and minimal sensitivity. For those with sensitive teeth who have shied away from teeth whitening products, Gentle Routine Whitestrips offer a brighter smile without the discomfort. But the lower peroxide level means the result will be less dazzling and will take the full 14 days of treatment to achieve. Do the whitestrips cover the front and back of your teeth? No – the Crest Whitestrips are designed to treat only the visible parts of the tooth. While some of the whitestrip folds around the back of the teeth, this is mainly for security purposes. Can Gentle Routine Whitestrips be used with a UV light? It is important to use whitestrips as directed to get the best and safest results. Using the product in other ways may result in permanent damage to your teeth. Can these whitestrips be used with veneers? No – whitening strips only work on natural teeth. Dental work such as veneers and fillings are not affected by the bleaching agent. Using the product with dental work may result in a color mismatch. Consult your dentist before proceeding. Are Crest Whitestrips gluten free? None of the Crest Whitestrips contain gluten. 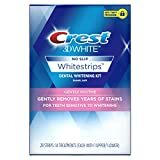 Can I wear Crest 3D White Gentle Routine Whitestrips overnight? No – these whitening strips should only be worn for 30 minutes at a time. Wearing them any longer could result in dmage to the teeth and gums. Should I brush my teeth before or after using these? While several online blogs recommend brushing your teeth before using these whitestrips, Crest advise against it. Brushing beforehand can aggravate the gum tissue and lead to irritation. If you are concerned about the adhesivity of the strips, you can simply dry your teeth with a tissue before applying. Gently brush your teeth after use to ensure that any remaining bleaching gel is removed. This helps to minimise irritation and sensitivity. Do Crest 3D Whitestrips expire? Yes – you can find an expiration date on the box. Once past the expiration date, the whitestrips will still be safe to use. However, the effectiveness of the bleaching agent may be compromised. Crest 3D Whitestrips With Light: Is It Really The Best?